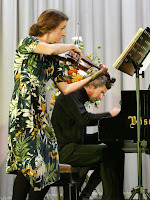 Jocelyn Freeman, pianist, who performed some of Rhian's other pieces with Elin Manahan Thomas last autumn. Rhian's song cycles for the CD are The White Amaryllis (May Sarton) and The Flowing Sand (Samuel Beckett). The third song of The White Amaryllis, 'Before Dawn' is one of RS's most performed works, in both its orchestral and piano versions. Paul will return to Tŷ Cerdd to record 'Yr Alarch' ('The Swan') shortly (one more piece for the disc! ); he's currently singing in La Traviata in Iceland. Jac Van Steen. The next day, baritone Roderick Williams with Andrew West, piano, sang her Summer Songs (Stainer & Bell, 2014) at the Barbican's Milton Court, London; just before, on 22nd February, Mary Hofman and Richard Ormrod gave the fifth performance of Rhian's Violin Sonata (Tŷ Cerdd, 2018), this time at Carmarthen Arts at the University of Wales, Trinity-St Davids, continuing the tour begun in October 2018. The next performance was at Aberystwyth University's Old Hall on 3 March, where Rhian gave a pre-concert talk about the Sonata to a friendly audience. A few days later, the RNCMD Harp Ensemble and Alicia Cadwgan, soprano, gave a brilliant performance of her 'Nantcol Songs' for soprano and 6 harps (Stainer & Bell, 2003) at their concert hall in Manchester. 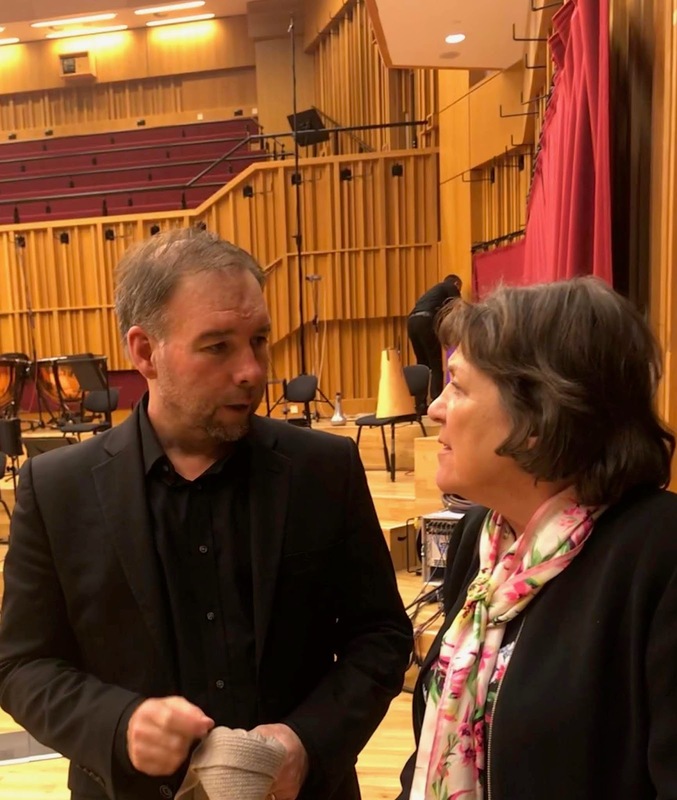 There was a lovely celebration of the 10th anniversary of the Hoddinott Hall, home of the BBC National Orchestra of Wales in Cardiff, on 25th January. 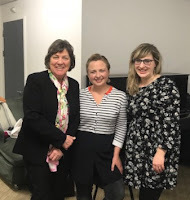 The programme included Rhian's Brass Express commissioned in 1994 by Reading University College of Land Management and first performed at the University's Great Hall by Anne McAneney, trumpet, and the Reading Univ. Symphony Orchestra, conductor Graham Treacher. 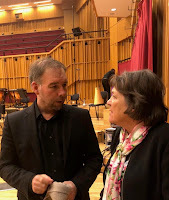 This time it was performed by Philippe Schartz, trumpet, and BBCNOW conducted by Holly Mathieson. The piece was broadcast on Radio Cymru, where Rhian gave an interview in her native (if somewhat rusty!) Welsh. A considerable number of Rhian's choral works, including premieres, were performed in late 2018 by choirs professional and amateur. 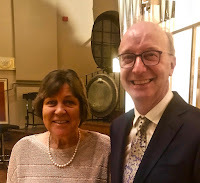 On 13th Nov Kings College London chapel choir, director Joseph Fort, sang Rhian's Love bade me welcome (S&B) at Evensong once again. 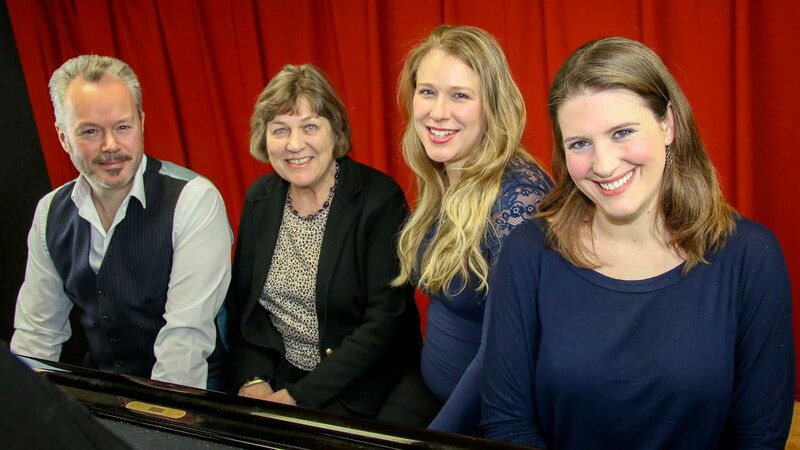 On 17th Nov the Ardwyn Singers of Cardiff, conductor David Leggett, pianist Janice Ball, premiered two sets of choral pieces commissioned from Rhian, Tair Alaw (Nesta Wyn Jones) and The Listening Eye (Anne Stevenson) (both pub. 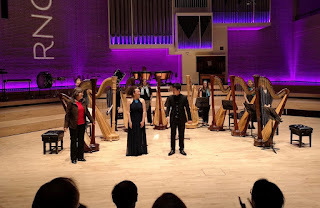 by Tŷ Cerdd), at the RWCMD Dora Stoutzker Hall, Cardiff. 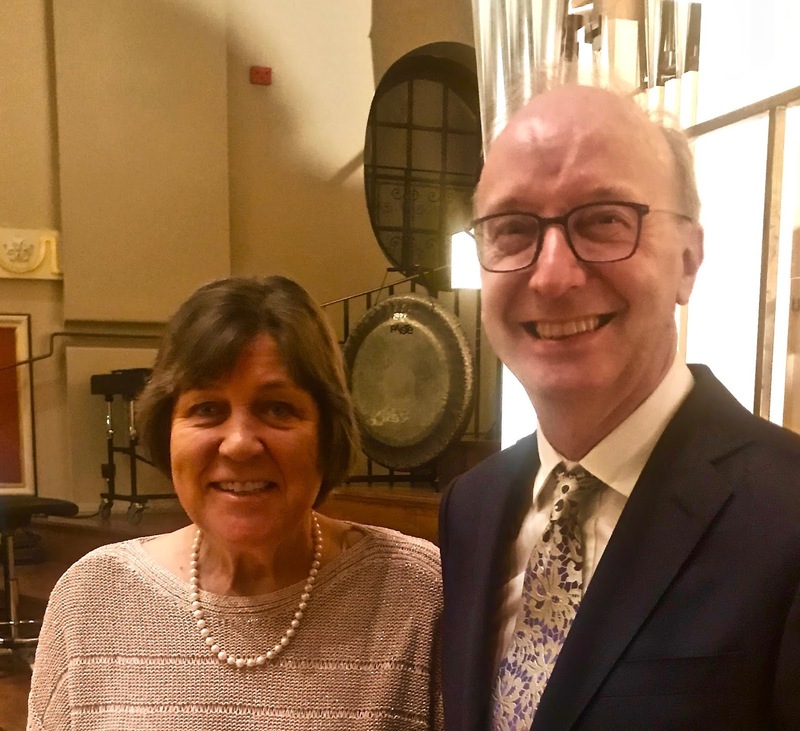 On 25th Nov Ave Maria (Tŷ Cerdd) was performed by the Copenhagen Royal Chapel Choir, conductor, Ebbe Munk, in Aalborg, Denmark; it had been performed by them twice previously at Copenhagen Cathedral in October. Then on 23rd Dec the Christmas carol, What Cheer? (S&B), was beautifully sung by the choir of St Laurence Church, Catford, London, director, Jocelyn Freeman, organist Nicholas Mannoukas. very busy one for Rhian: as well as the Ardwyn Singers' premieres (see above), her large-scale orchestral piece, Tirluniau (Landscapes) (S&B, 2000) was played at St David's Hall, Cardiff by the Royal Welsh College of Music and Drama (RWCMD) Orchestra conducted by David Jones; harpist Elinor Bennett played La Roca Blanca (Curiad) at Acapela Studio, Pentyrch, Cardiff and at the Rhyl Music Club and Professor David Titterington, Head of the Organ Dept at the Royal Academy of Music, gave a 2nd performance of Rhian's three new pieces, Ad Lucem (Tŷ Cerdd), at King's College Chapel, London. 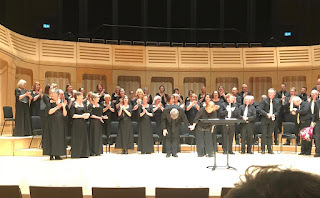 Also at Kings College, the choir directed by Joseph Fort sang Love bade me welcome (S&B) at Evensong (see above); and Rhian's Violin Sonata was given its 2nd performance by Mary Hofman, violin, and Richard Ormrod, piano, at Welshpool Music Society, mid-Wales. Mary and Richard continue to tour the work through March, 2019 and Rhian introduced it at both Machynlleth and Aberystwyth Music Clubs.